As we all try to keep focused on our New Year’s Resolutions, here’s some inspiration from some of the nonprofits who use the AWS Cloud for social good. These organizations focus their efforts year-round for the betterment of people around the world. Whether they fight for the environment, work to achieve medical breakthroughs, preserve the arts, or focus on building social good, AWS can help organizations pay for only the technology they use, freeing up IT spend to grow their capabilities for the long term. When an IT burden is lifted through AWS, the nonprofit organization is able to put their time and effort to make the world a better place. The four mission-driven organizations highlighted in this first entry in a series focus on helping global citizens, while we focus on supporting their IT. Thorn’s mission is to drive technology innovation to fight human trafficking. They work to provide law enforcement with intelligence and leads about suspected human trafficking networks and individuals, with the ultimate goal of identifying victims and connecting them with resources. Spotlight, powered by Thorn and Digital Reasoning, processes and analyzes the data from 150,000 ads per day based on risk profiles provided by law enforcement. Since October 2014, they have analyzed 65 million ads and 400 million images in Spotlight. Over 3,200 law enforcement officers use Spotlight in all 50 states. They have also gone mobile. Daily Spotlight users report a 60% time savings in human trafficking investigations. “AWS has been critical to our ability to deliver a world-class investigations tool that has helped officers across the country identify thousands of trafficking victims faster than ever before. We are grateful for this support that allows us to not worry about stability and storage – but instead focus our energy on constant improvement and innovation that helps stop trafficking and abuse,” said Julie Cordua, CEO, Thorn. Check out the video and SlideShare presentation from Thorn’s session at re:Invent 2016. FIA is a nonprofit organization that began in 2013 to distribute official child abduction alerts and tornado warnings across devices throughout the United States to those in the alerting area. FIA launched a working “Alert Hub” on the AWS Cloud in late 2015 in an effort to further standardize this practice and expand the availability of these alerts. The reliability, speed, and reach of the Alert Hub is transforming the way vital information is spread through local communities. The Alert Hub transmits free, life-critical emergency hazard information in under 200 milliseconds across the world to subscribers who can then use this data to disseminate emergency information to any affected area through use of Common Alerting Protocol (CAP). This free public service is always on, and has securely ingested, validated and distributed 720,000 official CAP alerts to subscribers. The World Bank Group has set two goals for the world to achieve by 2030: end extreme poverty by decreasing the percentage of people living on less than $1.90 a day to no more than 3% and promote shared prosperity by fostering the income growth of the bottom 40% for every country. In their work to eradicate extreme poverty, the World Bank Group needed modern technology and technology fit for purpose. They now use the AWS Cloud to disseminate information to their staff anytime, anywhere, and on any device. “We have spent the last three and a half years executing on that plan. We have ripped out and upgraded almost every single application and platform in the Bank. We have completely changed the technology landscape,” said Stephanie von Friedeburg, Group Chief Information Officer and Vice President, Information and Technology Solutions, The World Bank Group. Watch this video of Stephanie von Friedeburg talk about the organization’s cloud-first strategy and their transition to the cloud. UNICEF’s Imagine project brings together content from around the world as people upload videos of themselves singing John Lennon’s “Imagine.” At our AWS Symposium in 2015, David Ohana, Chief of Brand, UNICEF, talked about running workloads in the cloud and enabling better services for UNICEF. “To make sure that the world we imagine for children is heard loud and clear by key decision makers, the UNICEF Imagine team is hugely grateful to the AWS team for their continued support of this project. We chose AWS for the scalability, availability, and global reach. And as a result, we now we have some peace of mind that this idea may work,” said David. Watch this video where David shares how UNICEF is reaching a global audience in a more agile and cost effective way. Inspiring work from our nonprofits showing the intersection of technology and social good! Check back in with our upcoming posts where we will share more about how our customers use the cloud to achieve their missions, from saving the environment to achieving medical breakthroughs. 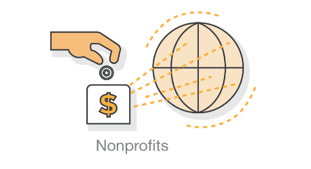 And visit our “Nonprofits and NGOs in the Cloud” page here.